Readers of this blog know the campaign to get Facebook to Unfriend Coal. 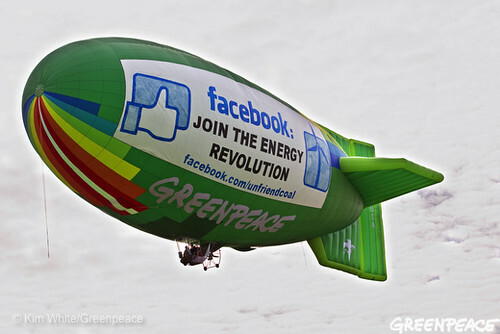 Since we first asked Facebook to power its services with renewable power in 2010, over 700,000 Greenpeace supporters have joined us. This campaign is about the choice we have as a society -- a choice between a future that is powered by dirty and dangerous energy, or one that is clean and sustainably powered, helping prevent catastrophic climate change. Three months ago this urgency drove us to issue an Earth Day Challenge for Facebook to announce a plan by April 22nd to put the company on the path to phase out coal and become clean energy champions over the next decade (see here for more details). This would not only be a wonderful present for Mother Earth, but especially timely considering Facebook’s rapid growth -- as the company is likely to build more data centres in the near future. As we detailed in our “How Dirty is Your Data?” report on Thursday, the IT industry has a significant and growing greenhouse gas footprint from its global network of data centres and related infrastructure. These data centres power the equivalent of tens of thousands of homes each. That is why it is important that companies build data centres that are powered by as much renewable energy as possible, instead of connecting them to coal and nuclear power, which unfortunately Facebook has done with its own facilities. Un-friending coal photo campaign in Norrköping, Sweden! People have been joining the campaign in droves. Some of you got involved in our photo competition, while others donned our Facebook t-shirts and made videos. Plenty of you passed along our new campaign video to your friends, and Facebook employees were greeted at their offices in London, Dublin, and Palo Alto here in California, with other events in Austin, Milan, and Stockholm. Incredibly, we are all soon-to-be-certified Guinness World Record holders, for the most comments on a Facebook post in 24 hours (averaging a comment a second for every minute of every hour). Plus some Facebook employees saw this on their way to work last week. Though this solar array may be quite small in the amount of electricity it can deliver relative to the amount required to power Facebook's new data centre, we see this as another encouraging sign . . . hopefully this initial investment in renewable energy will quickly translate into a bigger commitment to power Facebook with clean energy and move away from coal and other dirty sources of electricity. Greenpeace applauds efforts from IT companies to effectively improve the energy efficiency of their data centres. Facebook's Open Commute Project's emphasis on energy efficiency, as well as transparency, provides an opportunity to be an open-source model not only for the transparent use of equipment and design of data centres, but also transparency in the disclosure of data centres' emissions and energy sources. We look forward to engaging with Facebook to make this emphasis on open-sourced data fully holistic. In other words, this isn’t an either-or situation. The pathway to becoming a green IT company definitely does includes a trip to Energy Efficiency-land, but it also needs to set up residence in Clean Power-ville as well. The past months have truly inspired us here at Greenpeace. We are buoyed by the reception this work has received from people all over the world who clearly don’t want coal powering their status updates, picture sharing and video streaming. As our report yesterday shows, Facebook is playing catch up compared to companies like Google and Yahoo, which are stepping up their game in terms of clean energy leadership. The good news is that we believe that Facebook can also become a clean energy leader, and as this campaign continues to grow in the coming months, we will need everyone’s help to make a truly green Facebook a reality. Can you recruit 10 of your friends to the campaign (on Facebook, naturally) for Earth Day? Next: Does Greenpeace Hate the Internet? Previous: Google is on a Roll with Renewable..
we are the one who we have been waiting for Only We can save us!!! We appreciate the initiative taken by you to make notice of the dangerous gas emission through these companies. Facebook, Apple and other such firms should seriously think on this point and try to curtail their emissions. Thanks Greenpeace for this campagin. I'm actually considering whether or not to renew my membership, something I thought I never would do. I am asking to be persuaded otherwise. I consistently spread your campaigns and support you, my friends actually hear Greenpeace and think of me. I'm currently living in France, but for Christmas I sent my family Greenpeace t-shirts and had them take a picture and send it to me... However, I am extremely disappointed and confused. I am from a small coal mining town in Pennsylvania, so I strongly support sustainable energy as I have seen the affect coal has on the environment first hand. I have signed all of the petitions you've sent. I even wrote personal letters to the late Congressman Murtha engaging in a dialogue about changing the small town from a coal and steel based town to one focusing on the production of parts required to build the products to produce sustainable energy. As a result, I was closely following your "Defriend Coal" campaign...Or what evolved into the "Defriend coal by Earth Day" campaign which then devolved or vanished. I was studying the campaign as part of my digital advocacy class which is part of my Masters of Global Communication. I was eagerly counting down the hours until I would hear how Greenpeace would respond to the action that was obviously not being taken by Facebook (there was no build up on Greenpeace's part which made it quite obvious). However, instead, there seemed to be an effort to distract people from the campaign suddenly reemphasizing the Nuclear crisis in Japan and efforts in the Arctic. I tried to write objective comments to the Facebook page as well as the blog and my comments were either deleted or not approved. So I'm wondering...Why didn't Greenpeace use the momentum created behind the "Defriend Coal by Earth Day" campaign and the competition to hold Facebook accountable for not taking action? Any other campaign you would have used this as a launching point....Remember Nestle? Were you paid off by Facebook to prolong your silence? Are you in some agreement with Facebook? What is going on and why are you trying to silence people that ask questions? You hold other organizations accountable for their injustices...Aren't you being a little hypocritical? This is terrible PR on your part.